This page has some helpful information and resources for getting started with night vision for astronomy. A big challenge facing the astronomy community is that many of us live in major cities with significant light pollution. However, there have been several new recent developments in amateur astronomy which I think are game-changers for urban astronomers like myself. One of those is the practice of "video astronomy", or "near-realtime imaging", which uses a special CCD or CMOS camera attached to the telescope to display images on a computer screen after a very short period of time (on the range of seconds). This is different than normal astrophotography, in which exposures usually last for many minutes. However, you are still looking at a computer screen, and usually you have to wait 5/10/30 seconds for enough light to form an image. However, a more exciting development, from my perspective, is the use of latest-generation Night Vision devices for light amplification, both for 1x (unmagnified) views of the night sky, and through telescopes. Unlike "video astronomy", where you are looking at a computer screen, the night vision device provides a realtime, amplified view. For hunters and military personnel, this makes a dark nighttime terrain as bright as day. For amateur astronomers, this means that we can see the Milky Way from light polluted urban centers, and nebulas and other DSOs shine brightly. Fundamentally, Night Vision Astronomy is about using an analog "image intensifier" device to amplify the light from the sky. The technology and physics behind the devices is quite complex, and involves multi-channel plates and phosphor screens. These have been produced as military and tactical devices, and as astronomers we benefit from the innovation here. While Image intensifiers are not strictly new to astronomy (the Collins I3 and BIPH devices are the most well-known existing examples), the latest-generation ("Gen3" and "Gen3+") devices that have become available over the last few years represent a significant improvement in image quality, signal-to-noise contrast, and resolution. When used by themselves, with no filters and no telescope, night vision devices can show many, many more stars even in urban, light-polluted environments. Additionally, satellites and fainter shooting stars are readily apparent. Meteor showers are also transformed, because one can see many more faint meteor streaks. Under dark skies, the effect is truly amazing, with even more stars visible, and the Milky Way greatly amplified. Night Vision devices really are a game-changer, however, when used with filters. Using longpass red/infrared or other kinds of light-pollution filters cuts out most of the unwanted light, even in urban environments, and then the NV device amplifies the remainder. As a result, one can readily see the Milky Way, with glorious detail in its dark lanes, from almost any urban area, even standing next to a streetlamp. Additionally, the use of narrowband Hydrogen-Alpha filters (typically used for astrophotography) causes nebulae to pop into view, so that one can easily view large nebulosity like the North America nebula, without the aid of a telescope, even under bright moonlight and light pollution. The key to this is the light amplification: by aggressively filtering out all the unwanted light, the image intensifier tube will them amplify what's left, yielding gorgeous, realtime, as-wide-as-you-want 1x views of the whole sky. I am very hopeful that as these devices become more popular for astronomy, it will lead to a renaissance in urban "sidewalk astronomy" outreach events. First, it's helpful to read this great article on Cloudy Nights: Night Vision Astronomy 2015. This is the article that piqued my interest and got me started on night vision. There have been two recent articles in Sky & Telescope on Night Vision. The June 2018 issue has a "TNVC-Tele Vue Night Vision System" Test Report by Dennis di Cicco. The July 2017 issue featured an article, Seeing Through the Dust, which is discussed on Cloudy Nights here (the author of the article participates). There are also numerous night vision equipment and observation discussions on the "Electronically Assisted Astronomy (EAA)" forum on Cloud Nights under the "NV" tag. The Gallery, Observing Guide, and FAQ on this site are also helpful for getting a better sense of what Night Vision Astronomy is all about. If you're ready to take the plunge, then go check out the Night Vision Buyer's Guide! 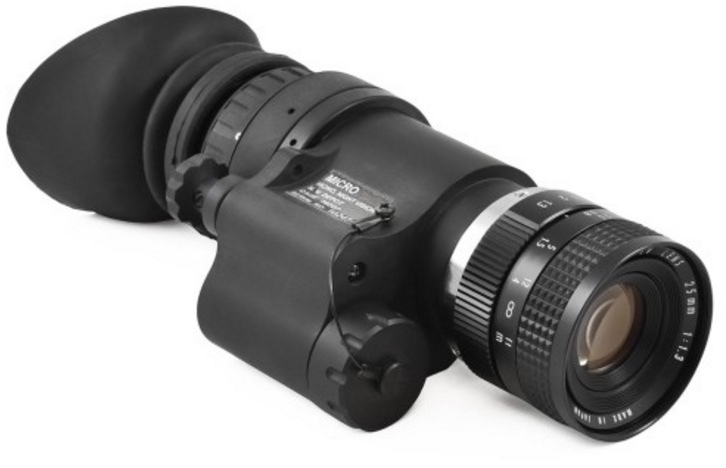 While there are many different night vision housings that can be used for astronomy, the most important factor on their use for astronomy is the kind of image intensifier tube they use. While "Gen2" tubes can be used productively for astronomy and are significantly cheaper than Gen3 tubes, I do not have direct experience with them. My research and efforts have centered around the Gen3 and Gen3+ tubes which feature much higher gain, albeit with a few caveats relative to Gen2. This device uses a single intensifier tube and an optical system to split the output into a binocular view. There is no manual gain control, and it is a green phosphor tube. There are multiple different classes of tubes that will fit inside this housing; the "D" tube is what you want. This device has manual gain, and is sold as a monocular. If you buy two, they can be combined to form a "true binocular", with a separate intensifier tube for each eye. It uses MX-10160 style PMT tubes (not the same as the PVS-7), so you can get L3 filmless green or white phosphor tubes. This tiny device also uses MX-10160 tubes (same as the Mod3), and it is slightly smaller than the Mod3. It does not have manual gain control. This is by no means an exhaustive list, however. 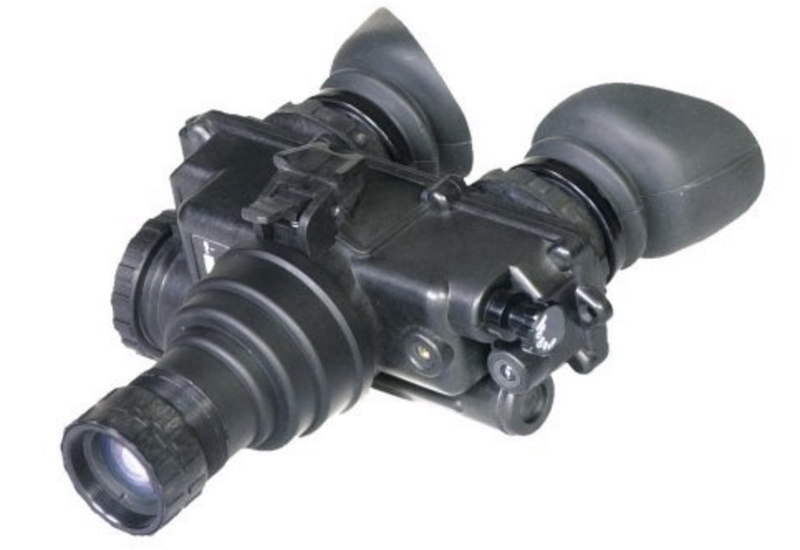 The PVS-14 is also sometimes recommended as a comparable monocular. However, due to its construction, the window of the intensifier tube is rather recessed in the housing, and this renders it unsuitable for use at prime focus. That means that if you want to mate it to your telescope, you are forced to use it afocally, putting it up to a regular glass eyepiece. See this thread on Cloudy Nights for more discussion on PVS-14 vs. Mod3. Many advocates of Night Vision on Cloudy Nights have the Mod3 monocular, and enjoy the use of prime focus rather than afocal projection. For more information, please see the FAQ article about Afocal vs. Prime Focus. Monocular, bi-ocular (one tube with a prism to split to two eyepieces), or full binocular (two independent tubes)? I have a PVS-7 Gen 3 with a good tube, and Mod3 with an L3 filmless white phosphor tube. I posted a comparison of the PVS-7 and the Mod3 on Cloudy Nights. Another user has posted his comparisons of the PVS-7 and a Mod 3 in a full binocular setup. I also have a fairly rare White Phosphor filmless PVS-7, which I talk about a little bit here. If you are not budgetarily constrained, I can recommend, without reservation, a Mod3 with a filmless tube. The only drawback is that it is a monocular, and some people prefer binocular views, especially when sweeping the sky at low power. The following are common accessories for astro night vision. For a more narrative walk-through, please see the Buyers' Guide. The items are listed roughly in order of utility and importance. 3x afocal lens: This slides on to the front of night vision devices and yields a 3x magnification. Can be bought used for ~$100 on ebay, or ~$300 new. General Light Pollution filter, generally an IR-longpass. A cheap and effective filter for larger diameters (55mm) can be obtained for about $10 from eBay, but this does not thread into the front of the night vision devices. Most NV astro users also use a red longpass filter, like a 610nm or 650nm. Narrowband H-alpha filter: dramatically enhances the view of emission nebula. The Orion 7nm Extra Narrowband H-alpha filter is a decent choice. People use all manner of bandwidths: 3nm, 5nm, 7nm, 10nm, 12nm. The tighter the passband, the more contrast, but also the less light enters, and therefore the more scintillation will be visible. 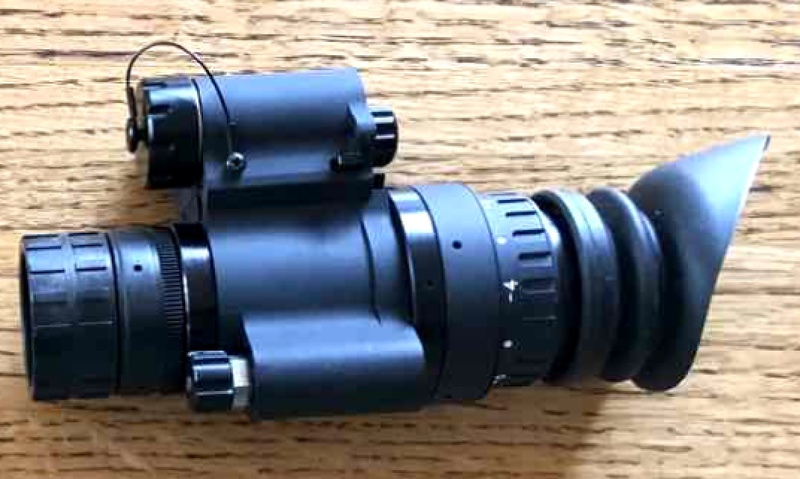 1.25" and/or 2" eyepiece barrel C-mount adapters: These thread into the C-mount threading in the front of the night vision device, and allow it to be used like an eyepiece. The focal length of the eyepiece is effectively about 24mm-28mm (depending on which night vision device is used). Because night vision devices are so much fun at low power, people have taken to using 50mm finderscopes as 7x low-power attachments. I also have one of these, and am very pleased with this setup. This thread discusses such usage.